A white powder made for use as a leavening agent which is added as an ingredient when preparing many different types of baked goods that will have thin shells or crusts such as puff pasteries, flat breads, crackers, and some cookies. Ammonium Biocarbonate is typically used with smaller baked goods that can quickly disperse and evaporate the ammonia gas as it builds up within the baked item. During the baking process, an ammonia aroma may be present, but it will not remain and will not be noticed in the baked goods when they are eaten. The result of using Ammonium Bicarbonate is a baked good that will have an light, airy, crispy, and somewhat fluffy texture. The term Ammonium Bicarbonate is actually an old term that is now more commonly referred to and replaced in recipes with the substance known as baking powder or baking soda. However, the use of actual Ammonium Bicarbonate substance is still preferred by some who want a lighter or crispier texture than can be achieved by using baking powder or soda. It may also be used as a substitute to remove the alkaline-like flavor that at times occurs in some baked goods when baking powder or baking soda is added. Many older European and Scandinavian recipes may use the term Baker's Ammonia instead of Ammonium Biocarbonate when referring to this substance. It is also often referred to as Hartshorn or Harts Horn which is a substance that is removed from deer antlers. It is important to understand that Ammonia and leaving agents such as Baker's Ammonia, baking powder or baking soda are not the same as household ammonia which is a poisonous substance and should not be used with foods or baked goods. Ammonium Biocarbonate is activated when it is added to a dough or batter mixture and warms to room temperature or is baked, since heat is the catlyst to activate the chemical reaction and the gases. The chemical reaction releases an ammonia gas that causes the baked goods to rise. Ammonium Biocarbonate should be stored in an airtight sealed container such as a glass jar with an airtight lid. When properly stored in a cool dry area, Ammonium Bicarbonate can last for several years. If stored in a warm or damp area where air can reach the powder, this substance begins to clump together as the particles go through a chemical reaction, which will affect the flavor adversely when baked goods use the air-exposed Bicarbonate. In addition, when exposed to air, the Ammonia may begin to evaporate from the powdered Bicarbonate substance. 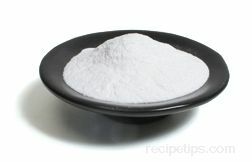 When a recipe suggests the use of Ammonium Bicarbonate, equal amounts of baking powder can be substituted if necessary. To determine if Bicarbonate is still active, add a spoonful of the powder to a cup containing lemon juice or vinegar and see if it fizzes. Stale Ammonium Bicarbonate will be flat and will not fizz when combined with the vinegar or lemon juice.